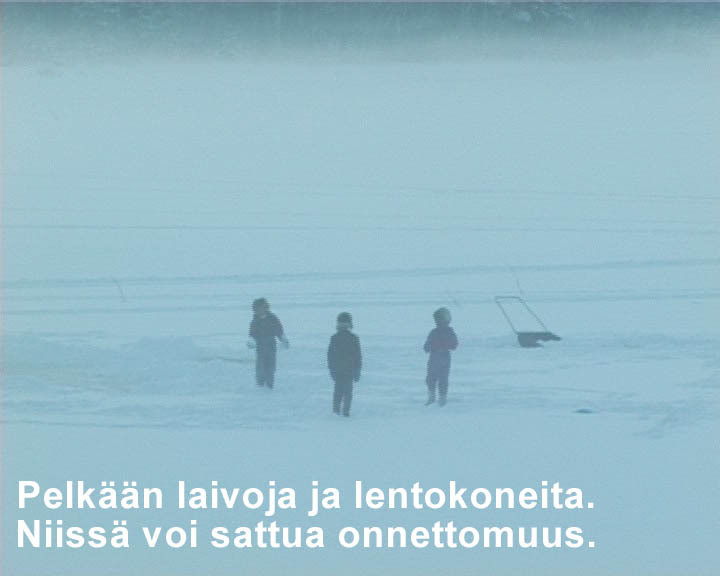 ‘2000.katastro.fi –This Moments Futures?’ 1999. Video still. 2000.katastro.fi – This Moments Futures? (1999) is a website and video projection in public space by the media art collective katastro.fi, in collaboration with the writers’ club Nobelistiklubi. Conceived as a kind of platform for alternative views into the new millennium, the project was realised during the autumn of 1999 and peaked during the change of the millennium, when the video was projected onto the outer wall of the Museum of Contemporary Art Kiasma in Helsinki. This wall faces the national Parliament building as well as the main street of the city. The website, updated weekly for the 13 weeks leading up to the millennium, included interviews and short stories related to fundamental issues such as love, work, reproduction, age, death, consumption, religion, power, and, most importantly, questions for visitors to the site. Their various answers served as subtitles for the video, which took on a kind of pseudo-documentary form accompanying the visitors’ thoughts with semi-fictional scenes of ordinary people, including a young couple kissing under a quilt, a construction worker welding, a kid’s lonely jump off the diving board at a swimming hall, and pigeons hungrily following a lady with pieces of bread. The 24 minute-long video is full of contradictory angles into the present order of things. This Moments Futures? is a website and video projection in public space by media art collective katastro.fi, in collaboration with writers’ club Nobelistiklubi.